In the paddle and switch flowswitches, the paddle is pushed by the water flow and actuates a microswitch. The seal between the paddle and the electric part is made by a Santoprene elastomeric gasket. Set point calibration value is given mainly by the paddle length and its the surface, the microswitch actuating force , the pipe diameter. 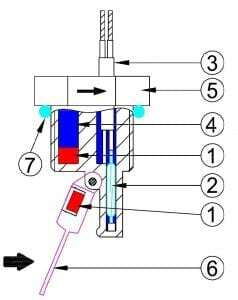 As in all paddle flow switches, due to the weight of the paddle, the setting will vary slightly according to the mounting position (horizontal or vertical, and in the latter case, flow inlet direction from top to bottom or from bottom to top). During assembly it is important to check that the paddle is correctly oriented in the flow direction and that no friction or obstacle hinders its movement. Therefore it is better to focus on devices with ¾” union nut mounting , or clips and O-ring assembly (type Ultimheat Snap-in), which allow easy aorientation djustment , unlike models with fixed thread. The temperature and pressure withstanding values, as well as resistance to chemical products are limited by the paddle gasket material. These models have the advantage of high electrical rating, and do not contain magnets, allowing them for use with liquids that may contain magnetic particles. In the ½” fixed thread types, it is possible to include a built-in temperature sensor: NTC, thermocouple, or Pt100, thus allowing the liquid temperature measurement. 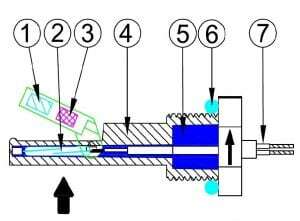 In the “in line” types, only a part of the flow, function of the ratio between the pipe section and the paddle surface actuates the flow switch. In the gravity pull-back paddle flow switches, when the upstream flow pushes against the paddle, the paddle swings away. 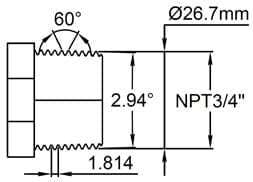 This changes the position of the magnet in relation to the reed contact and thus activates the contact. As soon as the flow decreases or is interrupted, the paddle moves back to its starting position, and reed switch comes back to its starting contact position. The force necessary to push the paddle is provided by the magnets repelling each other. Our fixed setting paddle switches use only two magnets, and our adjustable setting types have one extra magnet use for repelling force adjustment. This system has no communication or gasket between the paddle and the electrical part. No metal parts are in contact with the liquid, with the exception of some models with a titanium axis. Therefore they are particularly suitable for applications on aggressive liquids, swimming pool water, sea water, or chloration or bromisation equipment. Most models can be used on pipes from 20 to 100 mm diameter, by using an adapted length paddle. Set point calibration value is given mainly by the paddle length and surface, the diameter of the pipe, and, in adjustable versions by the position of the magnet position adjusting screw. 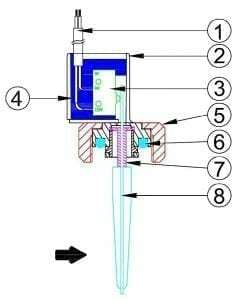 As in all paddle flow switch range, due to the weight of the paddle, the setting will vary slightly according to the mounting position (horizontal or vertical, and in the latter case, flow inlet direction from top to bottom or from bottom to top). During assembly it is important to check that the paddle is correctly oriented in the flow direction and that no friction or obstacle hinders its movement. As the paddle is magnetic, the circuit must be free of all magnetic particles. The low electrical ratings of the reed switches limit their use in pilot circuits or electronic circuits. During assembly it is important to check that the paddle is correctly oriented in the flow direction and that no friction or obstacle hinders its movement. Therefore it is better to focus on devices with ¾” union nut mounting, or clips and O-ring assembly (type Ultimheat Snap-in), which allow easy orientation adjustment, unlike models with fixed thread. As the paddle is magnetic, the circuit must be free of all magnetic particles. 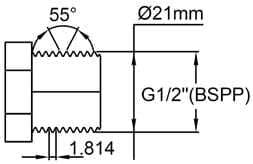 The low power ratings of the reed switches limit their use in pilot or electronic circuits. During assembly it is important to check that the paddle is correctly oriented in the flow direction and that no friction or obstacle hinders its movement. As the paddle is magnetic, the circuit must be free of all magnetic particles. 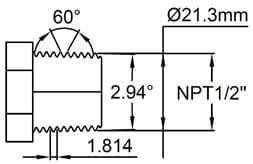 The low power ratings of the reed switches limit their use in pilot or electronic circuits. 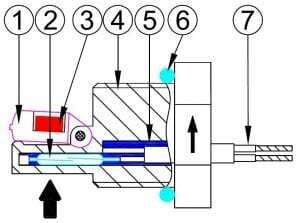 In “In line” flap reed flow switches, the hinged flap is moved by the water flow and closes a reed switch contact. There is no sealing problem between the liquid and electrical side, because both are completely separated. When the flow stops or decreases, the magnetic flap returns to its original position by its own weight (vertical position and bottom water inlet are required). The detection set point value is given by a variable mass lodged in the flap. This solution is suitable for small diameter pipes and wall mounting instant water heaters. As the flap is magnetized, the circuit must be free of all magnetic particles. These devices include a location for mounting an auxiliary system: water cooled triac heat exchanger, pressure switch, disc thermostat or temperature sensor. The low power ratings of the reed switches limit their use in pilot or electronic circuits. 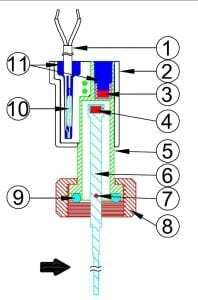 Inside “in line” piston and reed type flow switch, the piston, when displaced by the pressure differential from fluid flow, magnetically actuates a reed switch. 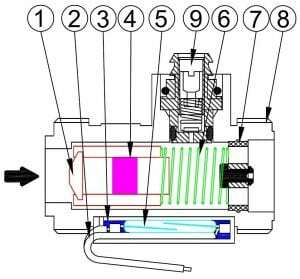 There is no sealing problem between the liquid and electrical part because both are completely separated. 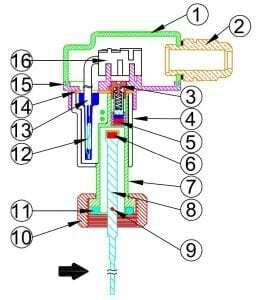 When the flow stops or decreases, the magnetic piston comes back to its original position by its own weight (vertical installation, water inlet downside), or by a spring (vertical, water inlet upside). 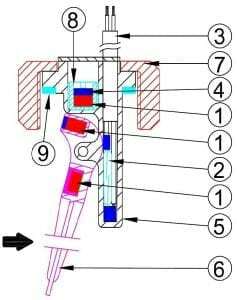 The detection set point value is given mainly by the piston shape, its mass and eventually by the spring pull back force. This solution is suitable for small diameter pipes. The piston being magnetized, the circuit must be free of all magnetic particles. 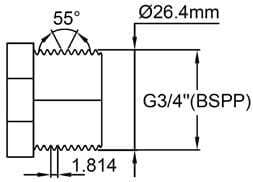 The low power ratings of the reed switches limit their use in pilot or electronic circuits. The electrical contact system: reed switch or micro-switch. The peak transient voltage that occurs when the switch opens is decreased to a value equal to the back to back Zener diode voltage. the reed switch, the contact closes. On snap action switches, contact opening speed is around 1m per second. The contact spacing reaches the distance to extinguish the arcing in less than 1/1000 sec. Therefore there is no radio interference, and the contact does not deteriorate. Mechanically, this type of contact, also called “energy storing contact” is much more complicated, expensive, and does not allow such a great control than reed switches. 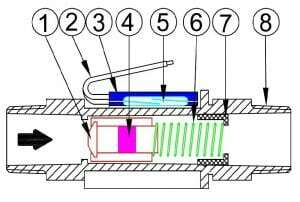 Selecting a magnet for a flow switch application must take into account the characteristics of the liquid in which it will be immersed, of the temperature at which it will be subjected, of its corrosion resistance, of the magnetic field required to operate the switch and its distance to the reed switches. Ferrite magnets have a good resistance to corrosion, but a very low magnetic power. Neodymium -Iron-Boron magnets contain 60-75% iron (amount is dependent on grade) and are therefore prone to corrosion, but a very big magnetic power. So these magnets are nickel plated and plastic overmolded. For reed switch systems, the most common electrical connection is by wires or cable. Given the low electrical rating of reed switches, conductor cross section is generally less than or equal to 0.5 mm ². If there is no thermal stress or environmental conditions, wires and cables are PVC insulated. Silicone insulation, FEP and Teflon are not recommended because they do not provide hermetic sealing with resin filling and may let water or moisture inside the product. 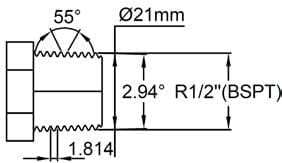 The mechanical displacement of the piston or paddle must be limited to remain within the limits of the magnet position detection by the reed switch. Device protection against electric shock, water ingress, pressure value, and chemicals. 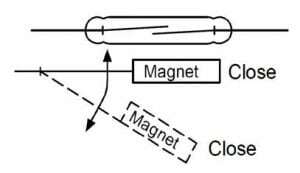 On flow switches using a magnetic mechanism, liquids containing magnetic particles such as iron filings must be avoided, because these particles will accumulate on the magnet. Protection against the conditions in which the product will be installed in its application. standards in this field of application. Overmolded reed switches do not have potential sources of ignition. On special request, they can be subjected to an ignition hazard assessment according to DIN EN 13463-1: 2002. They could be, therefore, not subject to directive 94/9/EC, and used as a simple electrical device for connection to a certified intrinsically safe circuit in accordance with DIN EN 60079-11: 2007.
inside the limits given by their data sheets and instruction manual. The correspondences between the threads, and they may have different names in different countries and often it is difficult to understand catalogs and plans. ½” BSPP and ¾” BSPP: cylindrical thread, described in ISO 228, DIN259, often called “cylindrical gas thread” or “BSP”, as described on the documents under the abbreviation “G”, and in France “cylindrical 15-21” (for ½”), and “cylindrical 20-27” (for the ¾”). Male cylindrical threads are mounted in cylindrical female thread, with a flat gasket or an O-ring seal on a flat seal seat. The tapered male threads are mounted in cylindrical female threads with a sealant on the pitch. In tapered threads, there is a strong resemblance between BSPT and NPT in sizes ½” and ¾”. 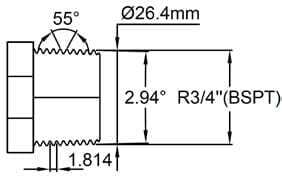 For these dimensions only, they have the same pitch, diameters very close, and a slight pitch angle difference (55° and 60°), and this explains why in some cases, and for plastic threads, ½” NPT male will fit quite correctly in a BSPP female thread. 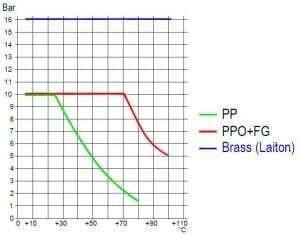 The Nominal pressure (PN) is the pressure which is often used in the design of a pipeline. 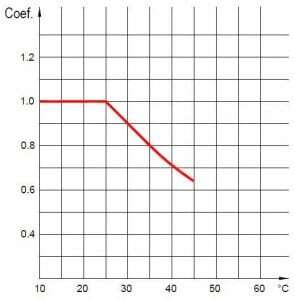 This value is expressed in bar, as the pressure at the temperature of 25 ° C for which the equipment is able to withstand pressure without failure and with adequate security during a given time. At 25 ° C the nominal pressure corresponds to the maximum operating pressure (PFA). This pressure varies with temperature and the characteristics of the material used, so great care must be taken when this concept is used. The main standard is EN 1452-2 for drinking water supply pipes in PVC. This standard provides the correction coefficient of the maximum operating pressure between 20 and 45 ° C for PVC.